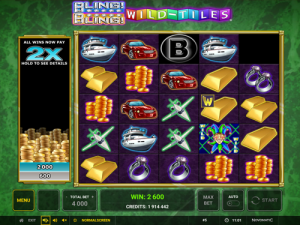 Bling Bling Wild Tiles is slot game brought to you by Novomatic and Green Tube. It’s unlike any other game from this developer yet it’s still distinctly Novomatic. It’s a tumbling slot game, so the symbols fall on the reels and tumble away, rather than the reels getting spun each round. There’s no Scatter symbol in Bling Bling Wild Tiles but there is a Wild symbol. This slot game also has a Bonus round, too. Everything about this game is bling bling indeed! The music, the sounds and the symbols all scream bling! This slot game is practically dripping with wealth. You might be too, if you manage to hit some big wins. But as always, playing a slot game is always a gamble. This game has five reels and five rows. It doesn’t have paylines but instead pays horizontally and vertically! You really have to play this game to see what it’s like. It has a bit of a Tetris feel about it. You can gamble your wins with the same Novomatic gamble game that they have in lots of their slots. You can also play Bling Bling Wild Tiles in autoplay mode. This game is simple and easy to understand, so would be good for beginners – although the rules aren’t all traditional ‘slot rules’ so a beginner won’t learn much about slots playing this game. Give it a go and bling on the wins! If you’re a fan of luxury then you’ll be a fan of this slot game. All of the symbols on the reels are bling-tastic! There are some money symbols and symbols you can dream of buying with all of your money! On the Bling Bling Wild Tiles, you’ll find symbols depicting: stacks of golden coins, single golden bullion, double golden bullion, a yacht, a sportscar, single diamond ring, double diamond rings, an airplane and a Wild joker. They all have their own unique payouts for 3, 4 and 5 matches which can be seen on the paytable. The Wild symbol can behave like any other symbol to complete a win. The golden bullions and the diamond ring symbols also give payouts when you match the single or double symbols, for example 2x single bullions and 1x double bullion (consecutively situated) will pay out. Seeing as this doesn’t work like a traditional slot game, even if you’re a Novomatic fan, you might need an explanation! There are no paylines in Bling Bling Wild Tiles, instead you need to get three or more matching symbols to fall next to one another, in a line, either horizontally or vertically. The matching symbols can fall anywhere on the square and as long as there are more than three in a row or column (next to one another), they will pay out. After the game adds the payout to the board on the left, the winning symbols will tumble away, leaving gaps in the 5x5 square. For every win of 3 three symbols (not 4 or 5), the middle symbol will turn into a Wild symbol. Tiles/symbols can keep on tumbling away and giving wins, as long as they keep landing in a winning way. Each win will be added to the board on the left. Once no more matches can be made, the words ‘Game Over’ will appear and the total sum of wins for that round will be paid to you, which you can either gamble or collect. Then the next round will start from scratch! There is big, mystery win in store for you if you manage to clear the whole 5x5 square in a single round. Before the start of every round, and before the tiles begin to tumble, you’ll see the background. Either it will be blank and black or you’ll see the word ‘bonus’ written down one or more of the columns. If, during that round, you manage to completely clear one of the columns with the word ‘bonus’ written on it, you’ll trigger the Bling Bling Bonus! The round will keep on going and keep on giving you wins until there are no more winning combinations, then the bonus round will start. The game grid will grow from 5x5 to 5x7 and all the tiles will be covered with a question mark. To the left will be displayed the number of tiles you have to match up to move onto the next round. Then you can begin choosing the tiles and revealing what’s underneath! If you don’t manage to match up the required number of tiles, then the bonus game will be over and you can collect your winnings. If you are lucky and you do manage to uncover the right number of matches, you can move up a level and get an even bigger win!